Asparagus may sound one of the more difficult vegetables to grow but in truth the main drawback is simply that it takes time to get from planting or sowing it to harvest, three years from planting asparagus crowns. Get over that hurdle and asparagus is very simple to care for and rarely attacked by pest or disease. Consider as well the fact that it can easily crop for 10 years, and in many cases up to 20 years. The crop is produced in May to June time when not many other crops are available. The calendar for asparagus is relatively uncomplicated which simply reflects the fact that it requires so little effort to care for it. Before using the calendar below, why not adjust it to your weather conditions? Not only will the calendar below be correct for your area but all dates in this site will also be adjusted. Your setting will last for six months or more and still be set when you revisit this site. If you prefer not to adjust the dates they will be the average for the UK. ASPARAGUS FROM SEEDS OR CROWNS? One year old crowns will produce a very small crop two years after planting and a good crop from the third year onwards. Seed raised plants will take one extra year to get to the same stage. Seed raised plants are much cheaper. For comparison, if you buy 20 two year old crowns of the variety Connover's Colossal they will cost you approximately £1 each plus £5 postage, a total cost of £25. A packet of seeds (70 seeds) including postage will cost you around £3.50, a very significant saving. Seed grown asparagus will occupy an extra year's space in your garden / allotment with no crops produced. Undeniably, raising your own plants from seed gives a greater sense of satisfaction. All asparagus crowns are not equal. Some suppliers skimp on packaging - we bought some asparagus crowns from Dobies and they were delivered in sealed plastic bags. Not a very good idea because they began to rot after two weeks. Some suppliers clip the roots (see the picture below) and some don't. Some crowns are of good quality and others have been badly grown or stored. We recommend Crocus if you are buying online and want quality crowns, correctly packaged and at a reasonable price. Asparagus varieties we would recommend are 'Ginlim' (RHS Award of Garden Merit), 'Pacific 2000' and a late variety to extend the season, 'Guelph Millennium'. All are available from Crocus. If you buy asparagus crowns to early, before the weather is OK to plant them, they may produce sprouts if they are not stored in very cool conditions, see the picture below. If your crowns do sprout, still plant them as described in this article but be aware that the sprouts may end up above the soil surface or very near the surface. The sprouts are frost tender so take this into account and plant later than normal to avoid frost damage. There are a couple of points to note when actually planting asparagus but ground preparation is the most important aspect. Position the asparagus bed where it gets as much sun as possible and consider that nearby shrubs and trees may well grow larger and cast a shadow. Your asparagus bed could well be productive for 20 years, so forward planning will pay dividends. Because asparagus have very shallow roots they need to be weeded by hand so prepare the ground well beforehand by removing all weeds. Dig the ground to a spade's depth and add lots of well-rotted organic matter. Asparagus do not grow well in water-logged ground so if the soil is heavy also add in some sharp sand to further improve drainage. Some articles advise preparing the area in autumn to let the soil settle before planting. We can't see the logic in this however because planting involves digging a trench which will loosen up the soil at planting time. Some methods plant the crowns lower than the surrounding ground and, as the stems grow, fill the top of the trench around the growing asparagus. This seems unnecessary to us and more work than is really required. Dig a trench 25cm / 10in deep and 30cm / 1ft wide. Fill the bottom 5cm / 2in with well rotted organic matter from the compost or heap or multi purpose compost. Using the soil from the dug trench, form a mound in the trench to the same height as the surrounding ground. See the picture below. Take each asparagus crown and place it on the top of the mound and gently spread out the roots. Be careful because they will be fragile. Each plant should be 40cm / 16in apart and rows should be 45cm / 18in apart. 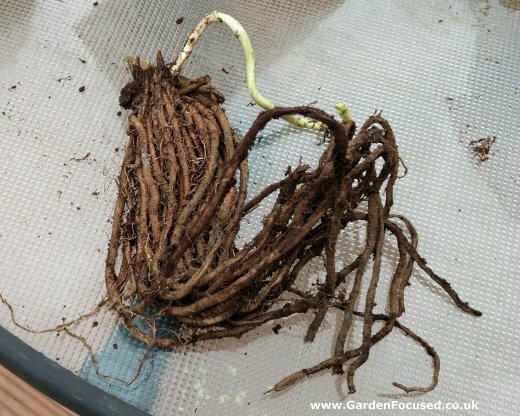 Allow a border of about 60cm / 2ft around an asparagus bed to let the roots spread. If you buy your plants well in advance of planting them, keep them at a temperature as close to freezing as is practical. If stored in warm conditions the crowns will sprout shoots and these will be vulnerable to frost damage at planting time. 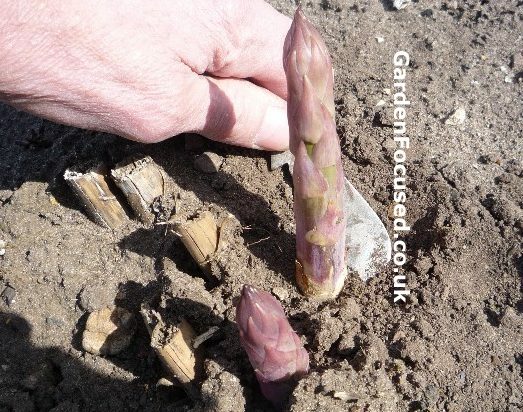 Asparagus are shallow rooted plants so they will need to be watered occasionally when conditions are unusually dry. As with most vegetables, a thorough drenching with water once is better than several. Feed once a year with a long lasting fertiliser such as blood, fish and bone. One good handful per plant should be sufficient. Regular weeding will need to be carried out to stop the weeds taking moisture and nutrients from the soil. 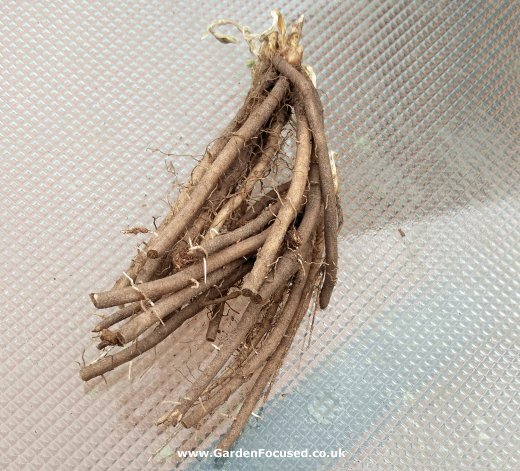 It's best to weed often because hoeing is not really an option, it will probably damage the asparagus roots which grow near the surface. Mulch once a year in autumn with well rotted compost or similar material. This will not only insulate the crowns from the worst of the winter weather but will also suppress many of the weeds and conserve water in the summer. When the foliage turns yellow in autumn cut it down to 5cm / 2in above ground level. If you don't prune in autumn the stronger winter winds may well pull some of the roots out of the ground and damage the crowns. Don't prune before the foliage is yellow, green foliage will still be absorbing energy and storing it in the roots. Asparagus tips should be harvested when they are about 15cm / 6in tall. If you let them grow larger than this much of the tenderness and flavour will lost. As a rough guide, harvesting can normally begin in mid April onwards but let the appearance and size of the spears be your guide. When an established asparagus bed starts to produce a crop you need to check it and harvest every two days because the spears grow so quickly, 5cm / 2in a day is not unusual. Stop harvesting in the last week of May and allow the remaining spears to grow tall and produce energy absorbing foliage. Do not harvest asparagus plants in their first year of life and only harvest four spears per plant in the second year. After that, harvest as described above. To harvest, take a sharp knife and cut the spears off about 3cm / 1in below the soil surface. Asparagus is like sweetcorn, the minute it is harvested it begins to loose sweetness. For the sweetest and tastiest spears, cook and eat immediately after harvesting. If that's not possible store in the fridge or freeze. For most, asparagus are very healthy plants but slugs, asparagus beetle and occasionally moles do cause problems. SLUGS - Asparagus are not their first choice but the tips of the spears can sometimes be eaten. Use your favourite slug repellent / trap to solve the problem. ASPARAGUS BEETLE - Immediately recognisable, these are black and white on their back, with orange on the lower sides and near the head. They are 6mm to 7mm long so are readily visible. In spring when the young shoots begin to appear the beetles lay their eggs (light brown and long-oval shaped) on the spears (remove the eggs by hand as well) which feed on the young spears. Several generations can occur each year and the adults feed on the foliage as well as the spears. The first course of action is to pick off any you see, in most cases this will get rid of them. The adults are most active in the afternoon. Clear up the foliage at the end of the season and remove any other leaves and debris around the plants at the same time. The beetles hibernate in debris around the plant. If that doesn't work, spray with a pesticide containing pyrethrum which should be applied just as the spears appear above ground and up to 6 weeks after that. QUESTION: I am just about to cut back the asparagus ferns here in the Isle of Man. Some of the plants have red berries. I assume that is not the best of news but not the worst either. Should I remove them, or at least cut them back in future before they become red. I assume that red means they have ripened. ANSWER: Ignore the berries, they are just the plants method of propagating itself. They start off green, go red and I think then turn black. It's just part of their lifecycle. They sap very little energy from the plant, so just leave them alone. ANSWER: In theory they should have no shoots. The problem is this that the garden centres want to encourage you to buy them ealrly and this has encouraged the suppliers to grow them earlier in the season than they really should. It's really stupid but life is what it is. The bottom line is that they will grow fine but just make sure you plant them after the last frost in your area. The shoots are particularly sensiive to frost. QUESTION: I'm growing Asparagus from seeds, sown indoors this March should I plant them into their final position later this year or into a seed bed for 1 year and then transplant next year as 1 year old crowns or keep in pots until 1 year old? ANSWER: You can do any of those options. I personally would wait until all danger of frost has passed and then plant them in their final position - it's the simple option. Remember to harden them off for a week or two before planting. QUESTION: I bought some asparagus crowns today but several have quite long shoots. Is it ok to plant now or should I wait until March and will the shoots be ok just to leave? ANSWER: Even in the warmer parts of the UK it's too early to plant asparagus out, especially if they already have long shoots. The crown is frost hardy but the shoots are not. The asparagus crowns have been stored in conditions which are too warm. Personally I would take them back to the store and ask for your money back or replacements which are not in active growth. If you plan to buy them some time before planting them they need to be stored at a temperature as near freezing as possible. ANSWER: It's difficult to be specific because you don't say what part of the UK you come from. Also you don't say when in March you planted them, there is a four week difference between early and late March. In cooler parts of the UK it wouldn't be surprising if they have not appeared yet although in warmer areas they should be appearing now. I certainly wouldn't dig them up yet. Wait at least another month. At that point it may be worth gently uncovering the soil from the top of one of the plants and see if there is any sign of life. If you need to replant, this can be done in autumn (see the main article above) as well as spring. COMMENT: I have just taken over an allotment plot, which has not been attended for well over a year. There are ten plants across the plot, my neighbour tells me it has been there for three years, it's all overgrown, can I save it. ANSWER: You certainly can and if the asparagus is three years old it is very well worth the effort. You have clearly identified the asparagus plants from the weeds because you say there are ten plants. So, you need to remove the weeds and when that's done the asparagus will come up next spring. The roots of asparagus are shallow so your only option is hand-weeding. If you persevere you will have an established asparagus bed next year. It may well take a couple of years to completely remove all the weeds. QUESTION: Should you harvest all the spears on established asparagus or leave some to grow? ANSWER: You need to leave some so that they transfer energy to the root system for next year's growth. Stop harvesting in late May / early June depending on where you live and let the remaining spears grow of their own accord.